A few quick thoughts on the 2013 Amici Cabernet Sauvignon from Spring Mountain. 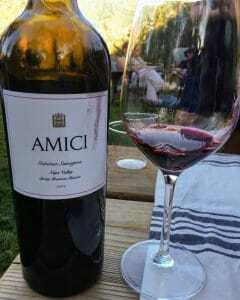 Amici Cellars was founded in 1991 by Jeff Hansen who named the winery “Amici” after the Italian word for friends. Hansen eventually sold the winery to Bob & Celia Shepard and John Harris who remain the owners today and have expanded Amici from being a “virtual winery” produced in a custom-crush facility to an established winery with the purchase of Greg Brown’s T Vine Wines facility in 2012. In 2010 Joel Aiken, a protege of André Tchelistcheff who spent 25 years making the BV Georges de Latour, joined Amici where he stayed until 2015 when he was succeeded by Anthony Biagi as winemaker. Biagi, who oversaw the final blend and bottling of the 2013 wines, previously worked at Clos du Val, Duckhorn, Paraduxx, Plumpjack, Cade and Hourglass before joining the Amici team. The 2013 Spring Mountain is 90% Cabernet Sauvignon and 10% Cabernet Franc that spent 22 months aging in 80% new French oak. Around 260 cases were made. Lots of rich dark fruits in this Cab. High intensity nose–lots of rich dark fruits of blackberry, black currants and black plums. After 30 minutes of air, blue floral and Asian spice notes with fennel and savory oolong tea begin to emerge. On the palate the richness and weight of the dark fruit still dominate–giving the wine a very weighty, full-bodied mouthfeel. Medium-plus acidity goes a long way in balancing the wine and keeping the fruit tasting fresh and juicy without straying into jammy or sweet. The high tannins are very ripe but very present which suggests that this wine has a long life ahead of it still. The long finish brings back the Asian spice and savory tea components from the nose. I first had this 2013 two years ago and, even though it was delicious then, it has come quite a ways. Still quite youthful this wine more than merits it $125-150 price tag as a top shelf Napa Cab that combines hedonism with complexity. Tagged Amici Cellars, André Tchelistcheff, Anthony Biagi, Beaulieu Vineyards (BV), Bob Shepard, Cabernet Franc, Cabernet Sauvignon, CADE, Celia Shepard, Clos du Val, Duckhorn, Georges de Latour, Greg Brown, Hourglass, Jeff Hansen, Joel Aiken, John Harris, Paraduxx, Plumpjack, Spring Mountain, T Vine Wines.